As long as skirts are short, women will wear nothing but sheer, leg flattering hose. Up to 1940, the most a woman could expect of a three threaded silk stocking was about 150 hours of wear. A glamorous two-thread stocking might, with luck, hold out for 100 hours of use. Developed by DuPont inventor Wallace Carothers and his team in 1935 the official name was Polymer 66. Starting from scratch, DuPont saw the commercial viability of trying to devise a method of stocking creation. This meant extruding the fiber, winding it on bobbins, putting a finish on it, knitting it into stockings on machines made to knit silk. Finally the technique of “pre-boarding” was developed and now used in all hosiery manufacture. The idea entailed placing the newly knit stockings on shaped forms and steaming them, which created the sheer finish. One early question was what to call the new fiber. Certainly women could not be expected to step up to hosiery counters and blithely ask for a pair of ‘hexadecamethylene dicarboxylics’ It simply didn’t role off the tongue ! Despite the long running myth of the the New York-London acronym, the true story of the origin of the name Nylon is somewhat less inspiring, beginning with the name No-Run. Sadly they did ‘run’ but a little clever word play finally produced, quite by accident it seems the quite meaningless name of NYLON. Simply because it sounded good and everyone liked it at DuPont. 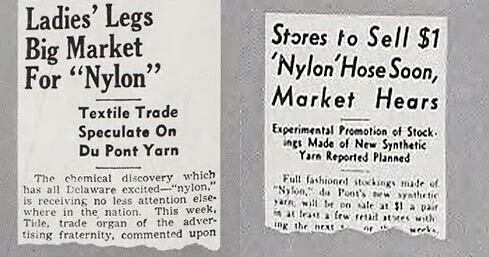 In 1937 DuPont hired the Union Manufacturing Company to secretly manufacture the first Nylon stockings that same year. As the scientists had yet to figure out how to make flesh tones from Polymer 66, these early stockings, with a cotton seam and silk welt and toe were black. Rumors quickly spread that DuPont had developed something revolutionary and that hosiery was top of the list as a potential product. 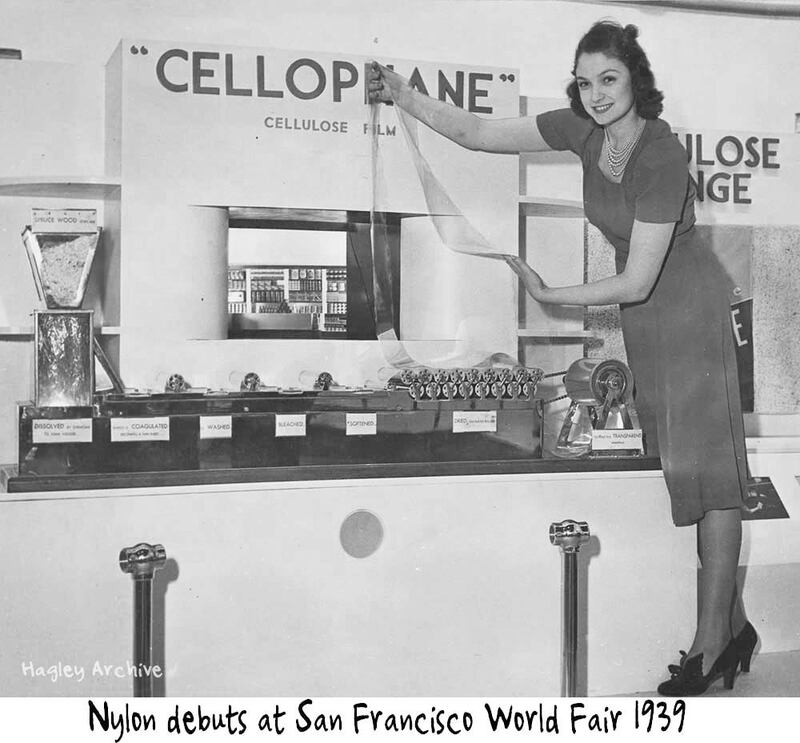 The first demonstration of the new wonder fabric of Nylon at the San Francisco “Golden Gate Exposition” in February 1939. 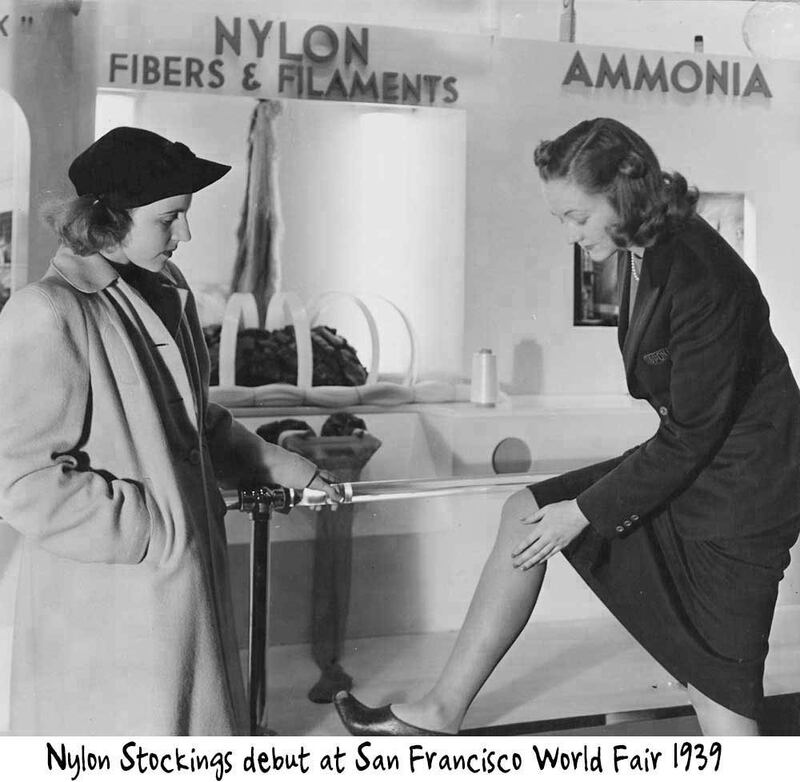 Two women put nylon stockings to the test st San Francisco World Fair. 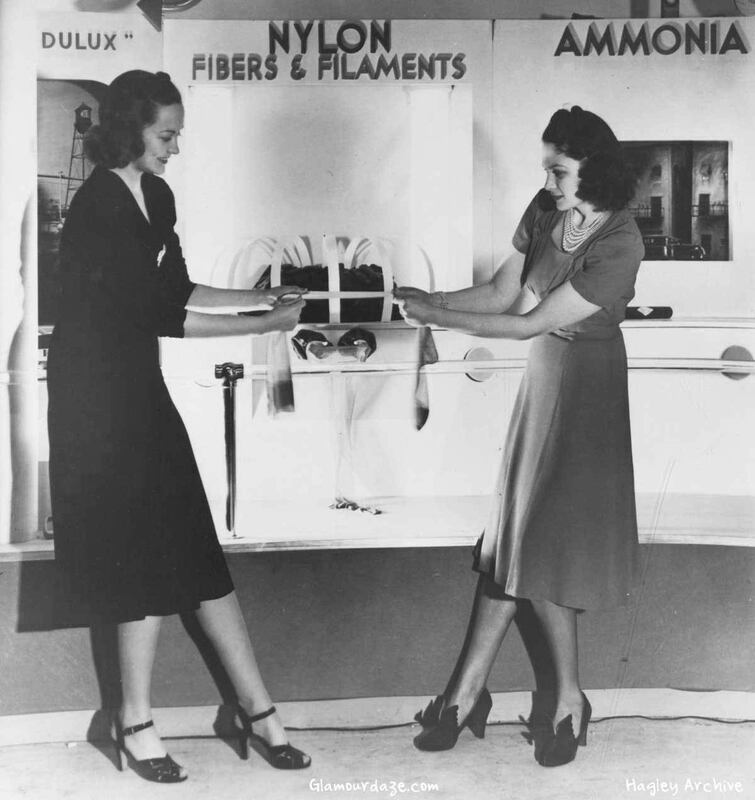 Following a low key public demonstration at the Golden Gate Exposition in San Francisco on February 18th 1939, DuPont went all out at the New York Worlds Fair in April, touting Nylon as a new wonder synthetic fiber made of “carbon, water and air.” The Nylon stockings show caused a sensation! 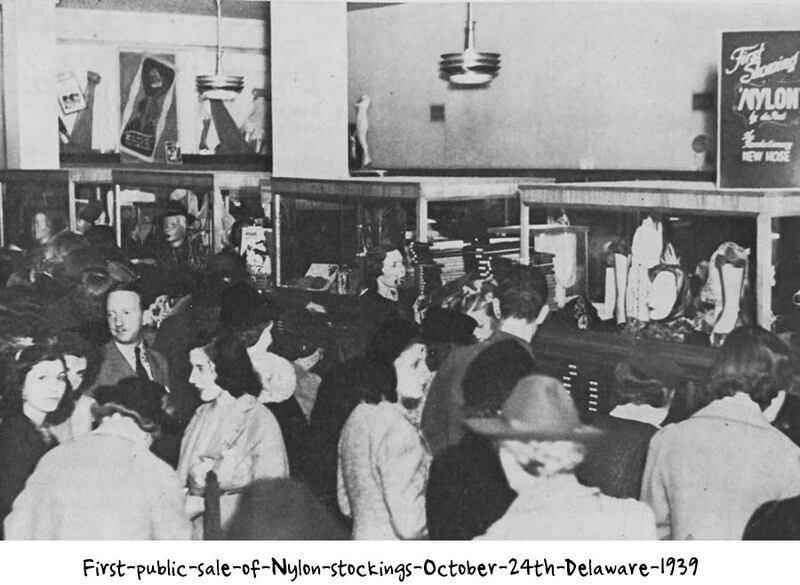 The first public sale of Nylon stockings was held later that year on October 24th at six selected stores in Wilmington, Delaware, the head quarters of Du Pont and where its inventor Wallace Hume Carothers and his team had developed the new super polymer. Sadly Carothers died two years before he could see the success of his efforts. Women had traveled from as far as Washington DC to storm the Delaware stores so as to be among the first to buy these new wonder stockings whose sale had been preceded by tales of fantastic sheerness and durability. They found hosiery that was sheerer than silk and infinitely more satisfying to wear. 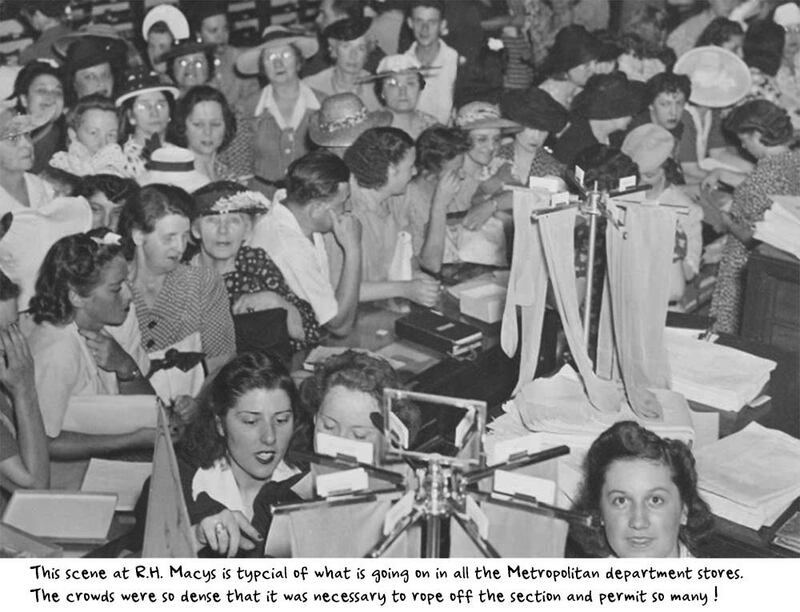 However the Wilmington experiment proved that women were ready and eager to accept Nylon hosiery, and stocking manufacturers began quantity production, offering 4,000,000 pairs for sale throughout the US on May 15th 1940, known hitherto as Nylon Day. In New York, 72,000 pairs sold in the first day. The nation’s supply of most wanted sizes was exhausted in four days. Women were jubilant at the thought of cutting their $400,000,000 annual silk stocking bill in half or less. 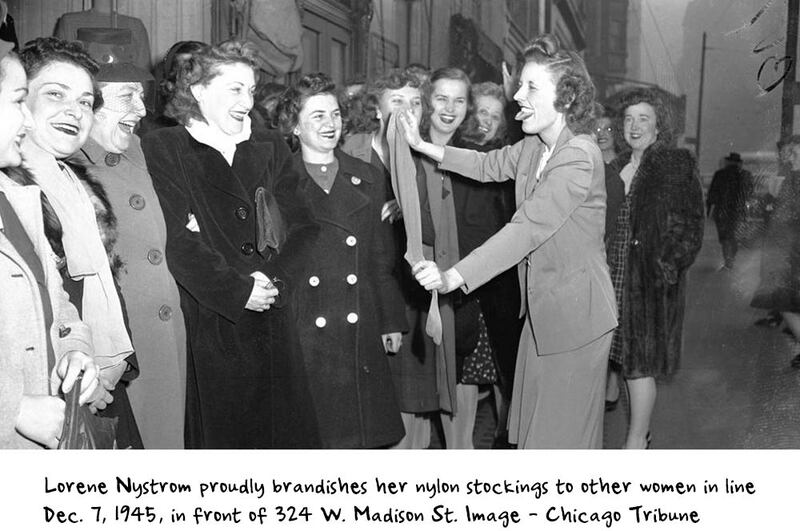 Fortune magazine in 1940 noted that American womanhood were divided into a small violently anti-nylon camp on one side and a larger, enthusiastic pro-nylon group on the other side. 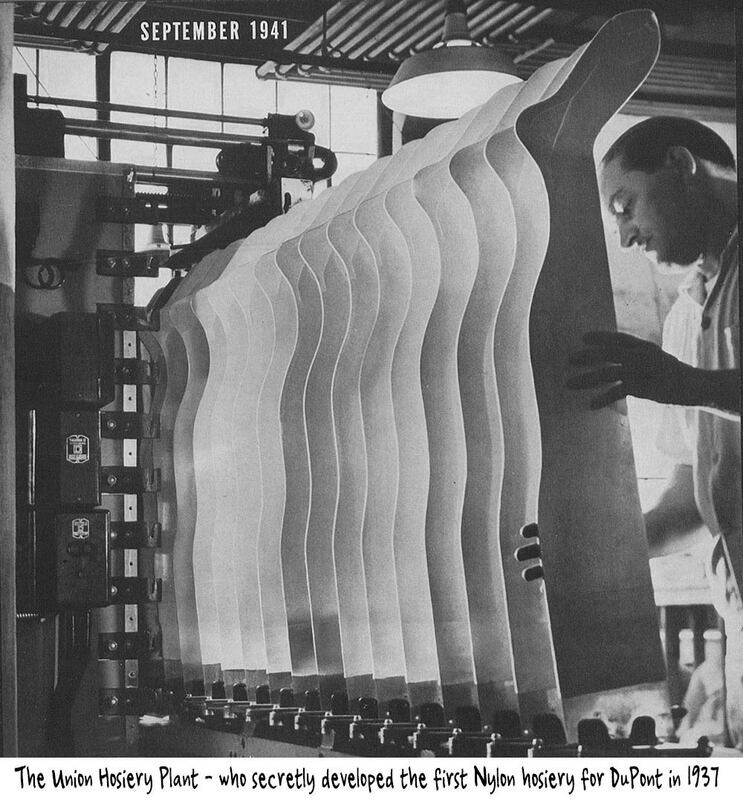 To determine for themselves the durability of Nylon, Life Magazine asked the United States Testing Co to test four popular types. Nylon out-wore on every test ! 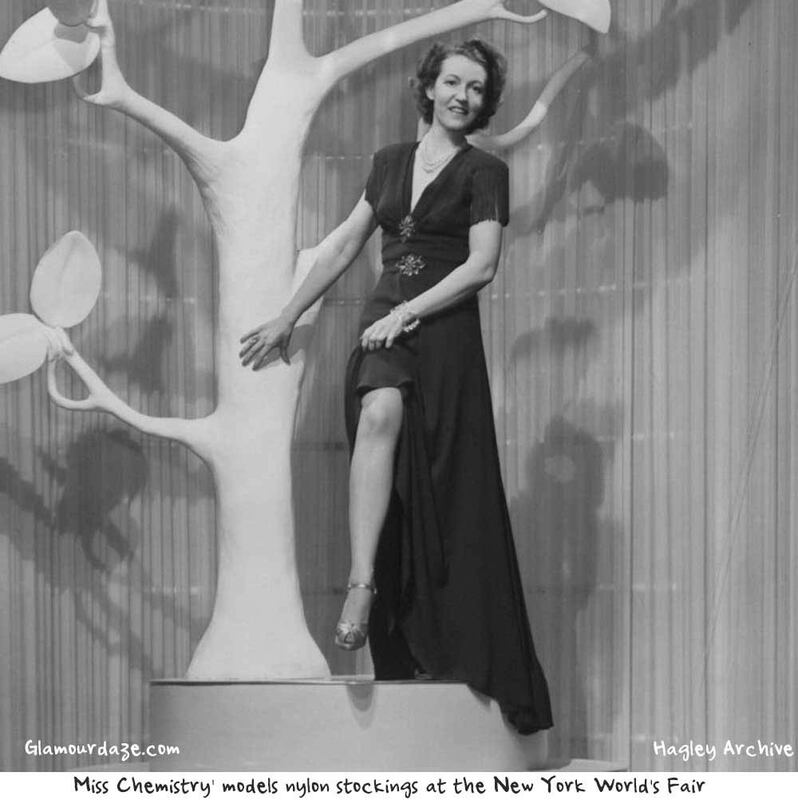 But American women had hardly gotten used to nylons and their differences from silk, rayon and cotton, when war broke out and nylon was classified as an essential material. DuPont ceased nylon production and began making heavier yarns for parachutes, ropes, tents, uniforms and so on. There was a rush for nylon hosiery before stocks ran out, that has gone down in history. In Denver alone, women bought $125,000 worth of stockings in just two days. 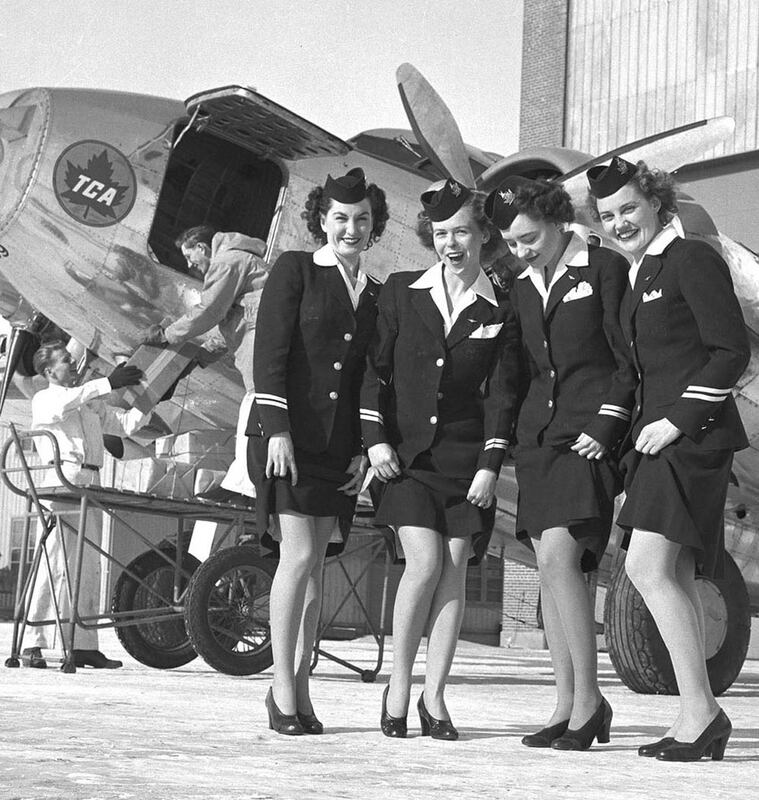 By 1942, Nylon stockings were in extremely short supply and remained rationed until 1945. When American servicemen arrived in Britain in 1944, their kit bags were copiously filled with Nylon hosiery, provided by the US army. Many an English girls heart was won over by a pair of coveted nylon stockings. 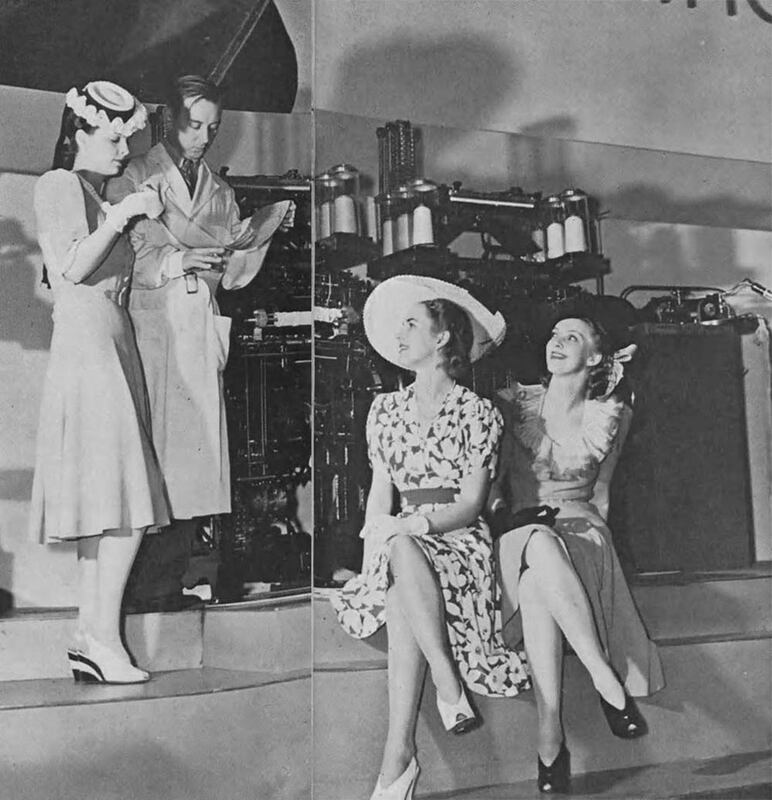 In 1945, just one week after the end of the war, in August 1945, DuPont announced that hosiery yarns were up and running again and there would be enough nylon manufactured to knit 36,000,000 pairs of nylon stockings per year, the equivalent of 11 pairs for every American woman. ” Nylons by Christmas!” became the motto of the country ! 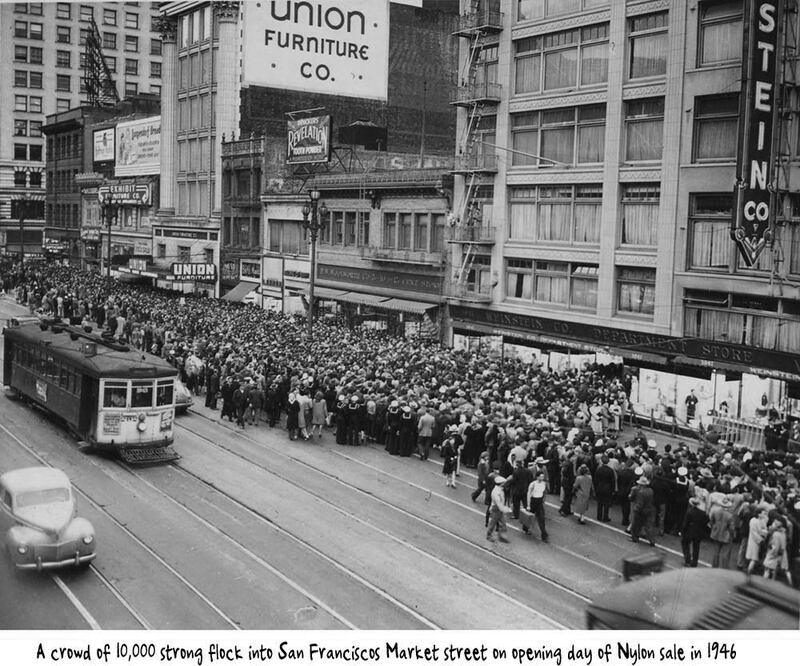 In San Francisco, the first sale drew a massive 10,000 into Market Street. The sale was called off after one of the display windows was pushed in by the force of the crowd, and several women fainted. In 1988, the forgotten genius of Nylon inventor Wallace Carothers was finally celebrated in an award winning Pretty Polly Advert.